Stable isotopic evidence for carbonate C fixation. 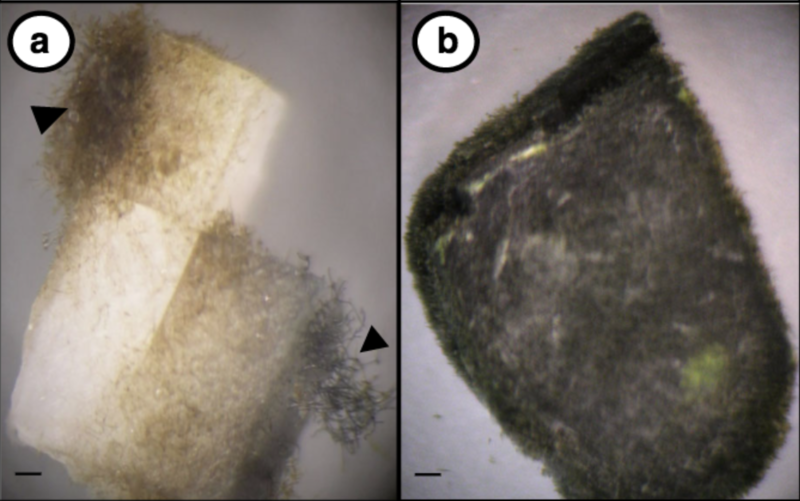 NanoSIMS images of cells analyzed for isotopic composition of organic C and obtained from different positions in a boring bed (scale =2μm), show the carbon on the outside (top) being taken up inside cells (bottom row). What they first saw in the lab was also representative of what happened with endolithic microbiomes in Nature. A: Shows a typical carbonate sample substrate including a local mollusk grazer (arrowhead). Scale bar is 2 cm. B: Shows a manually cracked cross-section of carbonate substrate, note the boring bed just under the rock surface (arrowhead). ASU School of Life Sciences Professor Ferran Garcia-Pichel led the new study. Former graduate student Brandon Guida performed part of the work as part of his doctoral dissertation. It was based on previous discoveries that described the ability of these microorganisms to excavate their own habitat, boring into carbonate minerals trapped in rocks. Maitrayee Bose with the NanoSIMS in the Center for Isotope Analysis, which was used to study the cyanobacteria. The Sandra Day O’Connor College of Law at Arizona State University is preparing to host its fifth annual Gold ’n Gavel Auction and Reception on Nov. 17. In addition to raising funds for student scholarships and celebrating the legal community, the annual gala will pay tribute to 50 distinguished alumni from throughout ASU Law’s history. Daniel Ortega, class of 1977: Practicing law in Arizona for the past 40 years, Ortega is a personal-injury lawyer, primarily concentrating on serious personal injury and wrongful-death cases. Alex Vakula, class of 1987: Practicing law in Arizona for the past 30 years, Vakula’s Prescott-based Vakula Law Firm focuses on the areas of real estate, financing, business and investment matters. Jason White, class of 1997: A partner in the Finance Group of New York-based Shearman & Sterling, White advises banks and other financial institutions on leveraged and investment grade acquisition financings, workouts, divestitures and restructurings. Melissa Bengtson, class of 2007: A partner with DLA Piper in Phoenix, Bengtson focuses her practice in the areas of corporate and securities law, mergers and acquisitions, and corporate finance transactions. This year’s honorees were moved by the recognition, expressing both humility and disbelief. Since graduating from ASU Law in 1977, Ortega, who has lived in Phoenix nearly all of his life, has focused on giving back to the community. Ortega said he takes a great deal of pride in being recognized, but also feels a bit awkward about it. Vakula, like White, isn’t sure the committee got the right person from his class — but he’ll gladly accept the honor. With their graduating classes celebrating milestone anniversaries, the honorees reflected on their experiences as ASU Law students — and their shared disbelief about how much time has transpired. The life-altering experience of law school, often coinciding with a transition into full adulthood, makes a lasting impression. Memories of relationships, the academic rigors and even the pop culture of the time are vivid, almost perfectly preserved in the mind. Ortega recalls a demanding period in his life, but one that yielded so many benefits. Indeed, the shared journey of law school, and all of the intensity and academic pressure that entails, creates a special bond, forging friendships that last a lifetime. Coinciding with ASU Law’s 50th anniversary, this year’s Gold ’n Gavel event takes on added meaning. This year’s honorees have all maintained close ties with ASU Law through the years. In addition to social and business interactions with former classmates, they have spoken at the school, helped students and stayed in touch with the administration. Vakula has worked closely with ASU Law in his current position as president of the State Bar of Arizona, and even though he now lives in Prescott, he’s been to the law school’s new home — the Beus Center for Law and Society in downtown Phoenix — a half-dozen times. White, who has been on the East Coast for 17 years, has yet to experience the Beus Center. So Gold ’n Gavel weekend will double as a long-awaited homecoming.